It can become uninteresting, as players quickly get used to faster pace. It can limit choice. Choice is central to video games. However, making choices can interrupt speed. It can cause frustration. Challenge is important aspects of video games. However, including challenges can cause frustration as when running at super speeds, the player cannot react to obstacles in time. When used as a basis for a video game, speed can create 3 key problems. Contrary to the old adage, you can have too much of a good thing. While travelling at high speeds is initially a thrilling experience, player quickly adapt to it, which causes it to be taken for granted. This causes speed to become repetitive and uninteresting. Choice is central to video games, as the ability to effect the environment as the player chooses is a key part of interactivity. Interactivity differentiates video games from other mediums (such as films or books), which do not provide the audience with direct control over the content. Making choices, however, can interrupt speed. 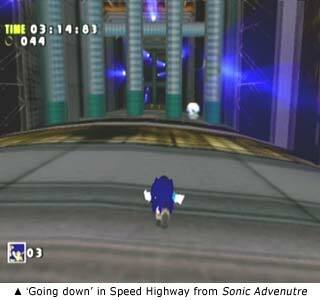 The ‘going down’ section of Sonic Adventure is one of the fastest levels in the Sonic series. However, its speed derives from the limits placed on player choice. If the player could make these choices, the flow of speed would be interrupted. Challenge is another key part of interactivity. Challenge serves to test the player and allows them to develop. This is an experience that is unique to video games, as other mediums offer limited means for testing audiences. Incorporating challenges into speed, however, is problematic, as while the Sonic games enable players to move at supersonic speeds, they do not provide players with faster reflexes. As a result, it can be difficult for players to react to obstacles. This causes frustration, as when the player takes damage, s/he is being punished for something that was impossible to avoid (at least without prior knowledge).